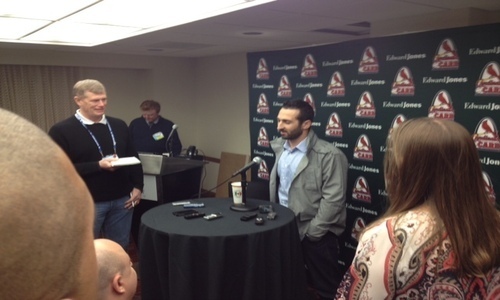 Daniel Descalso exited the 2013 season without knowing what his position for the upcoming season would be. That didn’t stop him from preparing in the same manner as he has every winter. He didn’t mind the short offseason, which was a result of reaching Game 6 of the World Series. When asked about his spot on the club this upcoming season, Descalso didn’t hesitate before saying he was ready to simply compete. Every athlete has a regime that has them hit the field and get their work in. Descalso has a group of 20 players including some minor league guys that get together In San Francisco to train. Descalso walked away from the World Series with a different feeling, losing in 6 to the Red Sox, but had accepted the result and was happy to be a part of the final action. This season will return Descalso to a bench role, but I have a feeling he will luxury in the limited playing time and rediscover that hunger to play again. The utility infielder stayed busy this past December when he got married along with his teammate Jon Jay. *Dan Buffa is the co-creator, administrator and writer for the movie website, film-addict.com. He also contributes to United Cardinal Bloggers, Arch City Sports, Aaron Miles Fastball, Voicesfilm.com and writes for his personal blog,www.doseofbuffa.com. He is also a published writer for the Yahoo Contributor Network. Dan is a St. Louis, Missouri born and raised writer with a need to inform and the ability to pound out 1,000-1,500 word pieces with ease. When he isn’t writing or drinking coffee, he is spending time with his wife and son in South City. Follow him at @buffa82 on Twitter and reach him for thoughts, comments and general feedback at buffa82@gmail.com. This entry was posted in 2014 Cardinals and tagged Daniel Descalso, Winter Warm-Up by danbuffa82. Bookmark the permalink.